Plants in the Mint family (Lamiaceae) are very hardy perennials with vigorous growth habits. 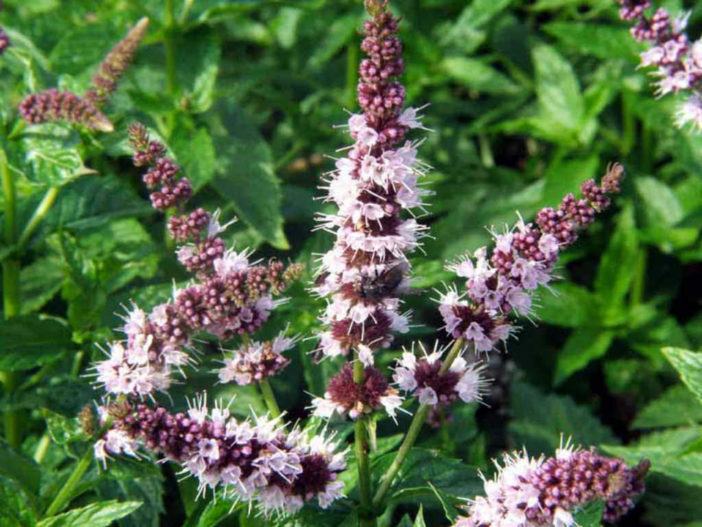 All types (including Sweet Mint, Spearmint, Peppermint, and Chocolate Mint) are fast-growing, spreading plants, so you must give them a place to spread without getting in the way, or plant them in a pot. Mint sends out runners that spread above and just below the ground, quickly forming large, lush green patches. In the right place it makes a pretty seasonal ground cover. You can also contain Mints in tight places such as between pavers of a walkway where your feet will brush against the leaves to release its fragrance. The spikes of white or pinkish flowers are attractive, but brief. However, they do attract bees, butterflies and even birds. Most Mints are hybrids and will not grow true from seed. Fresh leaves are a nice complement to lamb, fish, poultry, and vegetables such as peas, new potatoes, and carrots. Mint also blends well with green or fruit salads and beverages such as punch, lemonade, and tea. Two very well-known drinks, mint julep and Cuban Mojito, both depend on spearmint for their cool zest. Freeze Mint in cubes for iced tea. You can also preserve it in vinegar or dry it for potpourri or sachets. Light: Mints will grow in full sun to partial shade. Temperature: Depends on variety. Peppermint is very cold hardy, down to Zone 3. Spearmint handles the heat best, up to Zone 11. Soil: Mint prefers a rich, moist soil with a slightly acidic pH between 6.5 and 7.0. To contain the roots and limit spreading, you can grow Mint in containers, above or sunk into the ground. Be careful to keep container Mints from flopping over and touching the ground. Stems will root quickly, if given the chance. Snip sprigs and leaves as needed. If you don’t harvest your Mint regularly, it will benefit greatly from a shearing mid-season. At some point, you will probably notice the stems getting longer and the leaves getting shorter. That’s the time to cut the plants back by 1/3 to 1/2 and get them sending out fresh new foliage again. You can do small patches at a time, if you have a lot of Mint, and prolong the harvest season. All cuttings can be used, dried or frozen for later use. You can use, dry or freeze the cuttings. Sometimes gets rust, which appears like small orange spots on the undersides of leaves. Use an organic fungicide and try to allow plants to dry between waterings. Stressed plants may also be bothered by whitefly, spider mites, aphids, mealybugs.